Molds produce tiny spores to reproduce. Mold spores waft through the indoor and outdoor air continually. 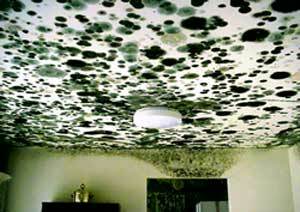 When mold spores land on a damp spot indoors, they may begin growing and digesting whatever they are growing on in order to survive. There are molds that can grow on wood, paper, carpet, and foods. When excessive moisture or water accumulates indoors, mold growth will often occur, particularly if the moisture problem remains undiscovered or un-addressed. There is no practical way to eliminate all mold and mold spores in the indoor environment; the way to control indoor mold growth is to control moisture. If you have IAQ and mold issues in your school, you should get a copy of the IAQ Tools for Schools Kit. Mold is covered in the IAQ Coordinator's Guide under Appendix H – Mold and Moisture . EPA's publication, Indoor Air Pollution: An Introduction for Health Professionals , assists health professionals (especially the primary care physician) in diagnosis of patient symptoms that could be related to an indoor air pollution problem. It addresses the health problems that may be caused by contaminants encountered daily in the home and office. Organized according to pollutant or pollutant groups such as environmental tobacco smoke, VOCs, biological pollutants, and sick building syndrome, this booklet lists key signs and symptoms from exposure to these pollutants, provides a diagnostic checklist and quick reference summary, and includes suggestions for remedial action. Also includes references for information contained in each section. This booklet was developed by the American Lung Association, the American Medical Association, the U.S. Consumer Product Safety Commission, and the EPA. EPA Document Reference Number 402-R-94-007, 1994. CDC's National Center for Environmental Health (NCEH) has a toll-free telephone number for information and FAXs, including a list of publications: NCEH Health Line 1-888-232-6789. The EPA publication, "A Brief Guide to Mold, Moisture, and Your Home" , is available here in HTML and PDF formats. This Guide provides information and guidance for homeowners and renters on how to clean up residential mold problems and how to prevent mold growth. A printed version will be available soon.